Well this feature is available in Adobe Reader since long. But I didn't notice it in a browser until Microsoft has added this feature to its Edge browser. If you're using the latest version of Windows 10 then your Edge browser can talk actually! Yes, it's tested and true! Let's see how . . .
Before you can start your edge browser to read aloud, make sure you're using the latest version of Windows 10. 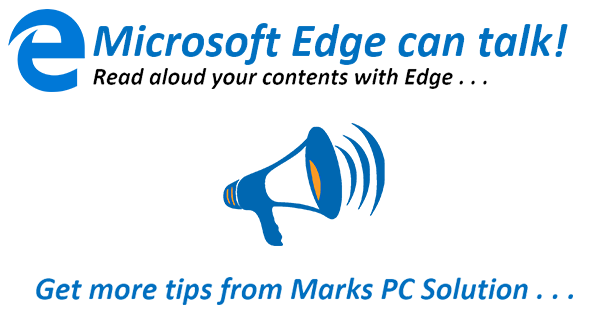 Run Microsoft Edge from your PC. After loading the page, click right mouse button somewhere and choose Read aloud. Now your browser will start reading the page word by word and line by line till the end! It can read out PDF files and E-books too! Not only web page, this newest browser can read your e-book and PDF files too. Locate your PDF file or e-book first. Then right click on it and choose Open with Microsoft Edge. 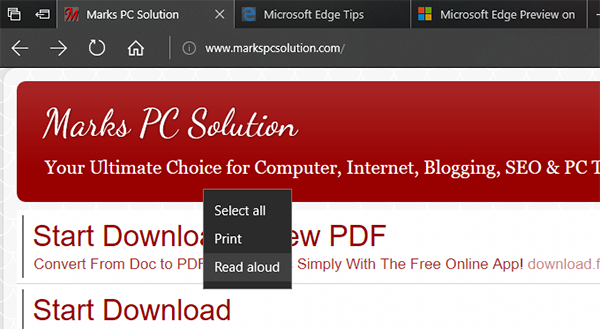 After opening the document, right click on it and choose Read aloud. The pronunciation is almost accurate except some words and shortcuts. Do the Same thing in Adobe Reader! Hope you will enjoy listening to your browser . . .